Copyright © 20011 American Geophysical Union. 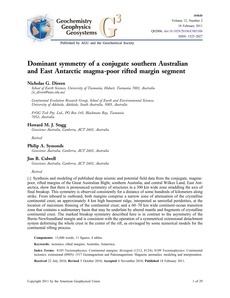 Synthesis and modeling of published deep seismic and potential field data from the conjugate, magmapoor, rifted margins of the Great Australian Bight, southern Australia, and central Wilkes Land, East Antarctica, show that there is pronounced symmetry of structures in a 300 km wide zone straddling the axis of final breakup. This symmetry is observed consistently for a distance of some hundreds of kilometers along strike. From inboard to outboard, both margins comprise a narrow zone of attenuation of the crystalline continental crust; an approximately 4 km high basement ridge, interpreted as unroofed peridotites, at the location of maximum thinning of the continental crust; and a 60¨C70 km wide continent©\ocean transition zone that contains a sedimentary basin that may be underlain by altered mantle and fragments of crystalline continental crust. The marked breakup symmetry described here is in contrast to the asymmetry of the Iberia©\Newfoundland margin and is consistent with the operation of a symmetrical extensional detachment system deforming the whole crust in the center of the rift, as envisaged by some numerical models for the continental rifting process.